The Think Tank Photo Retrospective line of camera bags are one of the newest series in their lineup. It’s also one of the few bags that you can get in something other than black. While I am certainly partial to black camera bags, I absolutely love the new Pinestone color on these Retrospective bags. There are several different bags in the Retrospective lineup – from the Retrospective 5 (for compact and mirrorless kits with a couple of lenses and accessories) to the Retrospective 30 (for handling a more pro-level kit up to a DSLR with 70-200 attached plus extra lenses and bodies). 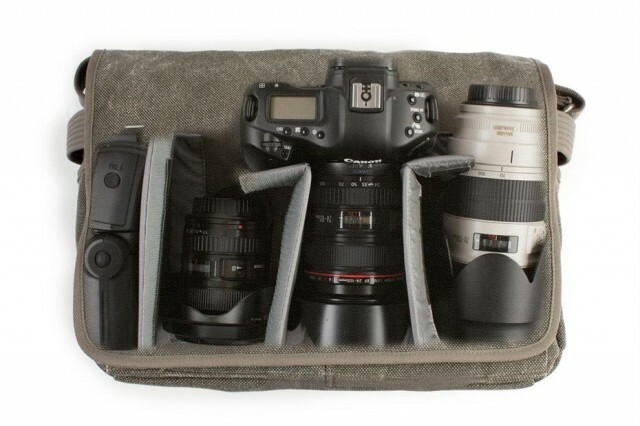 The folks at Think Tank Photo really know their stuff when it comes to designing camera bags. I’ve used a number of Think Tank Photo bags in the past; however, I think the Retrospective 30 is my favorite thus far. I’ve been using the Retrospective 30 (in Pinestone) for a couple of months now and it has become the defacto bag of choice for me. Even when I’m not toting a full DSLR kit with me, I’ll flip the dividers over to the side and stuff my 15″ MacBook Pro, Sony headphones and iPad in there. And, then I’ve still got room in the front pouches for a mirrorless or compact camera, along with plenty of accessories. So, what’s the max kit size you can fit in the Retrospective 30? Check out the variety of combinations below. 1 pro size DSLR with 70-200 f/2.8 attached, facing sideways and 1-2 additional lenses. The only downside I have with the Retrospective line of bags is that they don’t make one with a dedicated laptop sleeve. 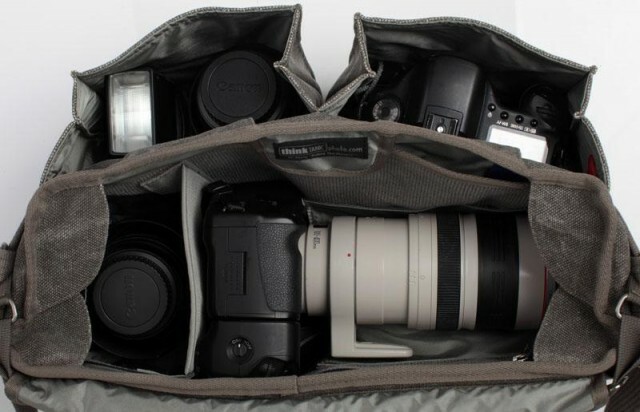 This is really a shooter’s bag, but it allows you to carry most of the camera gear you’re going to need for location portrait shoots. The only time it has not held everything on a portrait shoot is when I’ve taken a monolight out with me. In the main compartment, there is an extra sleeve that carves out an accessories area; however, it really doesn’t take away anything from the main compartment’s storage options. There are pouches for pens, business cards, cables and larger accessories. There is also a small tether with latch on the end for taming loose accessories, as well as a loop for securing little things like the Pixel Pocket Rocket or Pee Wee version. Also, the bag just feels good. The fabric is tough, yet soft, and the shoulder strap and pad are extremely comfortable for extended use. Side pouches give you convenience for toting water (in my case, Mountain Dew) bottles and even small umbrellas. Zippered pouches on the back and the inside give you options for storing flat things like magazines. As with every Think Tank Photo bag that I’ve ever used, the Retrospective 30 comes with a rain cover that can be quickly deployed to weatherproof it. In the end, the Retrospective 30 is just plain awesome. It looks good. It feels good. And it carries enough cameras and lenses to meet most portrait or causal photo outings. Highly recommended. Think Tank Photo is a sponsor of Photography Bay. 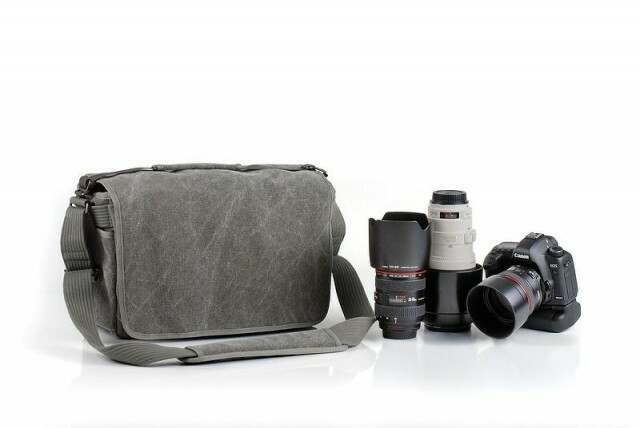 By making your photography purchases at Think Tank Photo through these links, you will receive a free bag or other accessory from Think Tank Photo upon checkout, and you are helping Photography Bay to continue bring quality camera tests, news and reviews. Thanks for your continued support. More money TTP is going to get from it looks like. Been eyeing this bag for awhile and your review has sealed the deal. X-Mas present to myself! My Restrospective 20 quickly became my favorite bag. I don’t understand the complaint about not having a place for a laptop. It’s not heavy enough with a camera body and 2-3 lenses? It is, indeed, a shooters bag. If you need to carry a laptop, then you need a backpack of some kind. Buy this bag. It’s outstanding.